LONDON, United Kingdom — Danone has taken breakfast protein pot brand AYEM under its wing as part of a new innovation lab set up to nurture disruptive startups into the leading brands of tomorrow, as well as diversify its own portfolio of products. The Manifesto Innovation Accelerator, which acts as a strategic partner and corporate venture group owned by Danone, invests in promising companies and entrepreneurs, helping to accelerate growth by providing access to its expertise and resources. The French dairy company’s previous investments include Farmer’s Fridge, Harmless Harvest and Yumble. 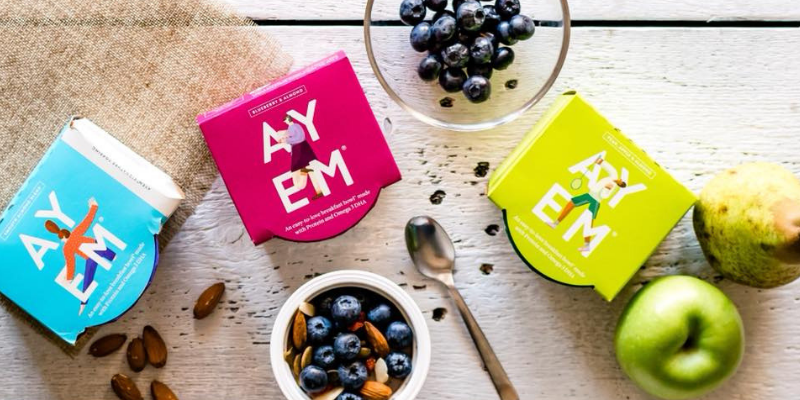 Launched this year, AYEM – a British brand producing a range of breakfast protein pots made from a blend of almonds, milk, fruit and seeds, and 15g of protein, has been designed to deliver nutrition for the body and mind. Created by Manuela Borella, a busy health-conscious mother with four young children, the range has been developed to be enjoyed at the breakfast table or consumed on-the-go. According to the entrepreneur, eating well is “at the forefront of living well, ageing well, enjoying life and supporting health”, so AYEM’s combination of protein and omega 3 DHA, to get minds and bodies off to a good start, “seemed like an obvious gap in the market to fill”. Having been able to bring her idea for AYEM to life under the guidance of Danone, which she says completely believes in and supports her vision, the brand has already launched into Ocado and other independent retailers across London, with more stockists in the pipeline for 2019. For Danone meanwhile, by adopting a startup mentality it hopes to stay ahead of its competitors in an increasingly saturated market. Its goal is to invest in 20 to 25 niche market startups by 2020 and utilise their trailblazing concepts to futureproof its own business. In particular, the company has its eyes firmly on the plant-based category –– just last month, it unveiled plans to fuel plant-based sales to €5 billion by 2025. “We are developing our unique portfolio of health-focused and purpose-led manifesto brands, acting as a catalyst for consumer reach. Our growth strategy focuses on valorized innovations to address some of the fastest-growing trends, notably among the younger generations,” Emmanuel Faber, Chairman and CEO explained. And the strategy is already paying off, with the company’s first-quarter revenue up by almost 5% in comparison to the same period last year, reaching approximately $7.53 billion. With more and more of the world’s leading F&B players, including General Mills, Unilever, Campbell Soup and Kellogg’s also launching venture capital units over the past couple of years, it seems as though the strategy of multinationals acquiring and learning from startups is here to stay. As consumer trends and tastes continue to evolve at breakneck speed, startups are able to pivot and respond to changes in the market much more quickly than larger companies, so the thinking seems to be that it’s better to collaborate rather than compete.